What's Noun Class Got to Do With It? The answer: everything. When we speak English, we mostly try to keep track of how many things we're talking about. For example, we know that it sounds strange to say "five car"* so we instead make a point of saying "five cars." In Swahili, the distinction between singular and plural is also important. However, speakers need to keep track of an additional category of grammatical gender, or noun class. This technically means that saying "five cars" is not the same as saying "five children" because of intrinsic differences in the way cars and people are categorized within the language. These intrinsic categories are referred to as noun class. The same goes for other attributes in Swahili like big, small, red, or white. And this can be a lot to keep track of for learners of the language. In this project, I worked closely with learners across proficiency levels to get a sense of how they do in keeping up with these intrinsic categories. This project takes up ongoing discussion of morphological variability in oral production, where a growing literature exists for the learning of French, German, and Spanish, in particular. 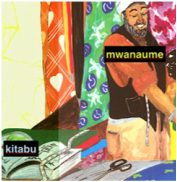 I created a picture description task with textless illustrations from the storybook Mcheshi Aenda Sokoni/Mcheshi Goes to the Market to elicit nouns and adjective pairings, and then followed up with recorded conversations in Swahili with learners, encouraging them to drive our exchange. 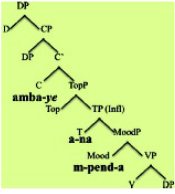 Intensive data from (N = 10) learners across proficiency levels illustrates a particular issue at the intersection of morphology and phonology, where the intrinsic category of noun class is overspecified in novel syllable onsets unavailable in typical input (e.g., /nk/, as in "Michigan ni nkubwa" or Michigan is big). More details to follow in my publication now in preparation on this subject. In this project, I tackled age-old questions about the ease of creating relative clauses--but with a new twist. 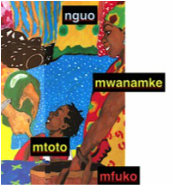 These questions have bearing on how we might choose to teach languages such as Swahili. 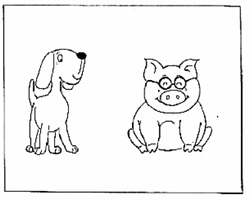 Considering there are three different ways to say "The dog who loves the pig" in Swahili, I examined how learners attend to these phrases. 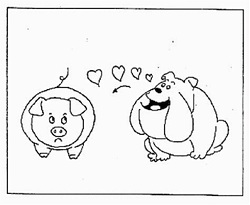 And I also examined the reverse: "The pig who is loved by the dog." Each type of relative clause makes use of -ye-, a form of relative marker signaling the hearer that some sense of who, which, or that is being used by the speaker. The experiment was conducted in two phases. First, I used a multiple-choice picture description task based on O'Grady, Lee, & Choo (2003) to elicit subject and object relative clauses. Next, I developed a new task to target preference for type of relativization. This new task was an online acceptability judgment, with an equal balance of nonce affixes. I used appropriate nonparametric statistical tests and factor analysis across the full set of data. Working with learners (N = 47) across proficiency levels, I concluded that the most preferred strategy is the amba relative. Learners also prefer to avoid passives, making subject relatives their most successful. This is consistent with other languages. However, structural accounts of Swahili (as opposed to linear accounts) are useful here, because they correctly predict why the amba relative is the most preferred. 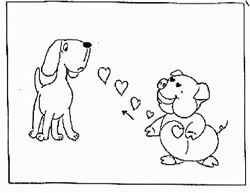 I argue it is a function of the distance between the relative marker and its referent (in this case, Mbwa, the dog). My resulting publication is available here.